Salary negotiation is an essential skill, but negotiating isn’t always so easy. Imposter syndrome, fear, and unconscious bias are real adversaries that can get in your way to a successful negotiation and earning what you deserve. The good news is that negotiation is a skill that can be learned. 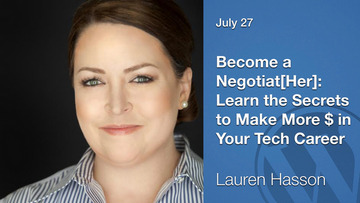 Come learn how Founder of DevelopHer, Lauren Hasson, tripled her base salary in less than two years by grounding herself in data and asking critical questions to uncover key leverage points and ultimately learned to negotiate with confidence. You’ll learn actionable steps you can take yourself to not only uncover your true market value, but also negotiate for the salary you deserve. Lauren Hasson is the Founder of DevelopHer (https://DevelopHer.com), a career development platform for tech women by tech women, and a software engineer at a prominent Bay Area fintech company where she builds their apps and is a principal member of their information security team. Her work has been featured in Apple keynotes, she was one of 100 top innovators invited to attend the UK G8 Innovation and Decide Now Act Summits with the United Nation’s technology council, and she’s won multiple, high-profile hackathons. She holds a degree from Duke where she completed a triple major with honors in electrical engineering, computer science, and economics in just four years. Lauren founded DevelopHer to help tech women advance their careers after learning she was paid 50% less than a male peer. And, because she invested in learning how to negotiate for herself, Lauren was able to triple her salary in less than two years. Now she’s on a mission to bridge the gender income gap, one woman, one negotiation at a time with her Become a NegotiatHer keynote and online course. She also hosts a podcast, The DevelopHer Show, which features leading tech women speaking candidly about their careers and lessons learned.